عمل فني في الهواء الطلق لڤازاريلي في متحف بمدينة پيچ. ڤيكتور ڤازاريلي (بالمجرية: Vásárhelyi Győző) (و.9 ابريل 1906-15 مارس 1997) مصور ونحات فرنسي الجنسية، مجري المولد. يعتبر أول من ابتدع فن الخداع البصري Op-Art. عمل كفنان جرافيكي في الثلاثينيات عندما أبدع ما اُعتبر أول عمل في الخداع البصري، وسماه زبرا (أي الحمار المخطط) وكانت تتألف من خطوط متموجة سوداء وبيضاء، وقد أعطى ذلك العمل الاتجاه الذي تبعه فازاريلي. فعلى مدى العقدين التاليين طور ڤساريلي أسلوبه في الفن التجريدي الهندسي. أعماله حققت له شهرة عالمية وحصل على أربع جوائز مرموقة. وقد توفي في باريس عام 1997. ولد فيكتور فازاريلي في 9 أبريل 1908 في مدينة پيچ بالمجر، ونشأ في پيشتاني (بالمجرية: پوستيين) وبوداپست حيث درس الطب لمدة عامين في جامعة بودابست. وفي عام 1927 ترك الطب ليتعلم أكاديمياً الرسم التقليدي بالزيت في أكاديمية پوليني-فولكمان الخاصة. وفي عامي 1928/1929 التحق بورشة (موهِلي) ساندور بورتنيك (والتي ظلت باقية حت 1938) والتي كانت مركز دراسات الباوهاوس Bauhaus في بودابست حينها. ولضيق الامكانيات المادية، فالورشة لم تستطع أن تعطي طلابها المدى الواسع لأسلوب الباوهاوس، وركزت على الفن الجرافيكي و التصميم الطباعي. تفوق ڤساريلي في الرسم لوحظ مبكراً. وفي 1929 رسم دراسته الزرقاء ودراسته الخضراء. وفي عام 1930 تزوج من زميلته كلير سبينر (1908-1990) ورزقا بولدين، أندريه وجان-پيير. في بودابست، عمل ڤساريلي في شركة لصناعة الرمان بلي في المحاسبة وتصميم الملصقات الإعلانية. ترك ڤساريلي المجر واستقر في باريس عام 1930، ليعمل فناناً جرافيكياً وكاستشاري لوكالات الإعلانات هاڤاس، دريجر وديڤامبيه (1930-1935). پورتريه ذاتي لڤساريلي، بپاريس، عام 1934. وتبعه في مدرسته هذه كثير من الفنانين، أهمهم بريجيت رايلي الإنجليزية التي ابتدعت عددا من الأعمال الضخمة التي تبدو وكأنها متحركة. انتشرت أعمال أصحاب هذا الاتجاه ونفذت تصاميمهم وأعمالهم في أشياء كثيرة كالملابس والأثاث وغير ذلك. وعلى الرغم من مرور أكثر من عقدين كاملين على اكتشاف هذه المدرسة إلا أن كثيرا من الفنانين اليوم لا يزالون يمارسون فن الخداع البصري. During this early “GRAPHIC” period (1929-1946), Vasarely laid out the esthetic foundation of his plastic research and “the basic repertoire” of his “period of kinetic abstraction on the spatial plane”. 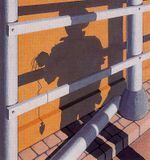 He exploits all the themes that were reformulated much later: the handling of the line, textural effects, interactions of shadow and light, and already a very particular attraction to perspective. We find these constants in his graphic studies in two dimensions such as The Zebras (1938), Chess Board (1935), and Girl-Flower (1934) where the shapes are not actually outlined but suggested by deformed grills or weavings of juxtaposed contrasts. 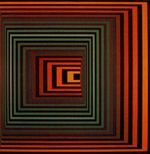 Between 1935 and 1947, Vasarely rediscovered painting. During this period, which he would later refer to as “my false routes”, influenced by the major plastic movements at the time, particularly cubism and surrealism, Vasarely focused on the still life genre, landscapes, and portraiture. 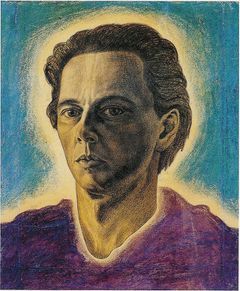 The paintings made during this period, Self Portrait (1941), The Blind Man (1946), although definitively figurative, show a certain evolution towards a simplification and schematization of the object. Then Vasarely had a true revelation: “pure form and pure color can signify the world...”. The works of the “BELLE-ISLE” period (1947-1958) marked the debut of an abstraction watershed for Vasarely, a stroke of genius, one that would allow the transformation of rough natural material into abstract material. It also marked a return to nature by the utilization of the geometrical form, the oval form in particular, which represented “the oceanic sentiment”. Between 1948 and 1951, two new periods appeared, taking even further the ideas already exposed in Belle-Isle. From the “DENFERT” period (1951-1958) emerged the curious drawings of the cracked white tiled walls of the Denfert-Rochereau metro station in Paris. The alternation of backgrounds and forms, the enmeshing of the sun splashed or shadow blurred walls and the spaces between these walls, correspond to the origin of the “CRISTAL -GORDES” period (1948-1958). In the studies from these periods, forms are juxtaposed in beaches of contrasting colors on a flat surface. Vasarely rediscovers the contradictory perspectives of axonometry, the power of pure composition. The most representative work of this period is “Homage to Malevitch” (1952-1958), which marks the turn towards kineticism. In this painting the square has been turned on its axis and transformed into a rhombus, thus creating a visual principle that would always remain at the center of the artist’s kinetic research. In 1954, Vasarely returns to this homage for the construction of his first architectural integration at the University of Caracas, Venezuela, in collaboration with architect Carlos Villanueva. With the “BLACK & WHITE” period (1950-1965), Vasarely resumes his graphic studies, his work on linear grills, and his undulating deformations. Meanwhile, he explores his interest in photographic techniques creating “photographisms” made from the superposition of two sheets of glass. The “BLACK & WHITE” period marks a fundamental moment in Vasarely’s work, since it is in this two-colored phase where he develops and defines all the basic elements of what would eventually be known as Op-Art, a unique aesthetic and style that would remain forever linked to his name. In 1955, at the Denise René Gallery in Paris, kinetic art was flourishing. 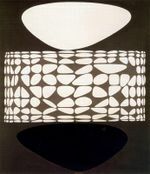 Vasarely and other artists such as Duchamp, Herbin, Man Ray, Calder, and Tinguely exhibited their research on the theme of movement. That same year Vasarely published his “Yellow Manifest”, enunciating the notion of “visual kinetics” (“plastique cinétique”), by way of which he resumes the research of constructivist and Bauhaus pioneers: movement does not rely on composition nor on a specific subject, but on the apprehension of the act of looking, which by itself is considered as the only creator. The principle of optical illusion was first explored in black and white. From a dialectic of geometrical shapes, “two geometrical elements that fit in each other, combining, permutating”, emerged a notion of movement and space. From 1960 on, color was added to the formula in the “FOLKLORE PLANETAIRE” period works, which lead to the invention of the “alphabet plastique” (fine arts alphabet). With the creation of a comprehensive “alphabet plastique” he brought to concretion the idea, born at beginning of the century in the work of the first abstract artists, of creating a universal fine arts language understood by everyone. This alphabet plastique is the point of departure towards a truly collective art. By playing with its combinations and permutations, an unending number of propositions can be achieved just by rearranging the forms or the color gamut defined by the artist. “The arrival in plastic art of a matrix of such breadth of scope offers a tool of universal character, completely allowing the manifestation of personality and ethnic particularities.” In this matrix the elements can be codified or programmed. 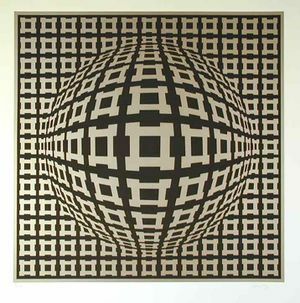 Moreover, Vasarely incorporated the significant contributions of new breakthrough techniques and technologies in order to diversify and compose works ad infinitum. Thus, the basic elements could be prefabricated using modern industrial procedures, allowing the works to become monumental pieces integrated into architecture in general and into our contemporary urban environment. 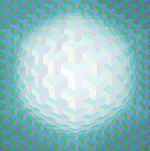 From 1964 to 1976, Vasarely became particularly drawn to cellular structure in a series of works belonging to “Homage to the hexagon” theme, where surfaces were subjected to ceaseless transformations, as much as in the form of indentations as in the form of relief. Ambiguity was further accentuated by adding the element of color variations, thus creating a “perpetual mobile of optical illusion”. 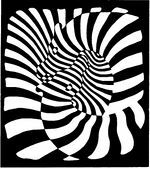 Vasarely had re-submerged himself into the optical domain he had explored with his “BLACK & WHITE” period. These effects can be observed in the works of the “GESTALT” period. In 1965, he participated in the “Responsive Eye” exhibit at the New York Museum of Modern Art, dedicated exclusively to “Optical Art”. This pictorial movement attached itself to the concept of suggesting motion without ever actually performing it. It instituted a new relationship between artist and spectator, where the observer cannot remain passive, he is free to interpret the image in as many visual scenarios ha can conceive. Received with great acclaim, the press and the public hailed Vasarely as the inventor and creator of “Op-Art”. 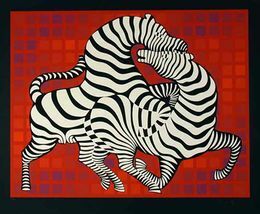 Continuing his studies on movement and perception, Vasarely returned to drawing in his “VONAL” period (1964-1970), where he rediscovered his linear work on the theme of the zebras, the grills, and the origins of his black and white period, this time incorporating the element of color. A new kinetic aspect was engendered as well as a new spatial dimension through the repetition of lines decreasing in scale as they approach the center of the painting. From 1968 on, playing with the deformation of the line, Vasarely defined his “universal structures”, and dove into the immensely popular and widely known “VEGA” period, where the swellings induced by the deformation of the elements of composition give the illusion that the forms escape from the flat surface, thus creating his famous spherical volumes. Through works such as “Feny” (1963), “Vega Tek” (1968), and “Vega 200” (1968), the artist attempts to evoke the unattainable universe of galaxies, the gigantic cosmic pulsation, and the biological mutation of cells. 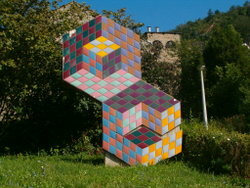 The creation of the Vasarely Foundation in Aix-en-Provence in 1976 marks the concretion and culmination of his ideas on the integration of art in the city. 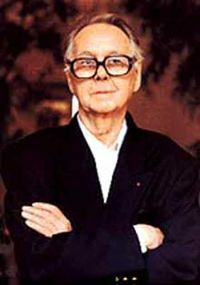 In March 15, 1997, he died at the age of 91, leaving behind a plastic legacy unrivaled within the domain of abstract geometrical kinetic art. قبعة ڤـِگا، 1979، اوپ آرت، تيمة تجريدية، أكريليك. إمساك 1-2، 1945، اوپ آرت، تيمة حيوانات، زيت على كانڤاس. پورتريه ذاتي مـُكسـَّر، 1942، اوپ آرت، زيت على كانڤاس. دراسة تروپ لي، 1936، اوپ آرت، تيمة تجريدية، أكريليك. دراسة خضراء، 1929، اوپ آرت. نمور، 1938، اوپ آرت، زيت على كانڤاس. دراسة الحركة، 1939، اوپ آرت، تيمة تجريدية، أكريليك. تولنا، 1953، اوپ آرت، زيت على كانڤاس. كرلـو، 1947، اوپ آرت، تيمة تجريدية، أكريليك. مندورو، 1954، اوپ آرت، تيمة تجريدية. حمار وحشي، اوپ آرت، زيت على كانڤاس. E.G.، عام 1965، اوپ آرت، تيمة تجريدية، أكريليك. ڤونال، 1968، اوپ آرت، تيمة تجريدية، زيت على كانڤاس. في المتحف الوطني للفن المعاصر (سنتر پومپيدو). Gold Medal at the Milan Triennale. ارسل بريدا الكترونياً للإداري Webmaster بالمعلومات المطلوبة أو ناقش الموضوع في صفحة النقاش. Fondation Vasarely This site is currently down - March 31, 2007. Aix em Provence Tourism Board This site has some information on the Foundation Vasarely in Aix en Provence, France. مشاع المعرفة فيه ميديا متعلقة بموضوع Victor Vasarely.